Every travel snapshot has a story to tell and sometimes those stories get lost until you flip back through a photo album or digital folder full of your travel snapshots. Or worse… lost forever because you simply never shared them! Each week we will share one of our favourite travel photos that has a great story to tell and share that story with our readers. It may be about a really awesome travel moment we had, a unique experience, or form part of a funny memory. This week’s snapshot seems like a little bit of a morbid share, and to be honest it’s not really an experience I would put high on my must see Paris list, however on our first trip to France back in 2008, my father in law was very eager to visit this very famous Parisian cemetery – Pére Lachaise Cemetery. Don’t get me wrong, as it was an interesting place with some very old tombstones and crypts. 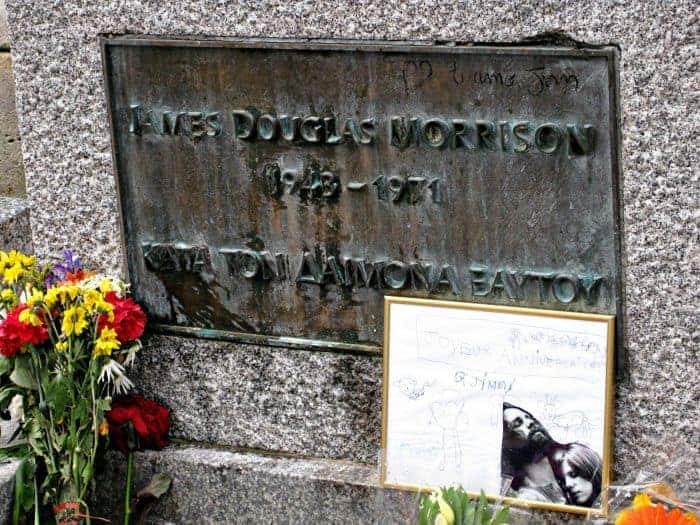 There are also some very famous creatives buried here, including the owner of this gravestone, Jim Morrison – the lead singer for The Doors. We grabbed our map at the cemetery entrance and began our exploring, finding the graves of people such as Chopin, Edith Piaf and Oscar Wilde. However we were having no luck finding Jim Morrison’s grave site and somehow came to split up into pairs or solo. Eventually most of us found each other once again, as well as eventually finding the grave site. It was partially hidden behind a construction zone and with the construction tape around the edges of the grave, it was all a little shabby. Not surprising being such an iconic music legend. Feeling somewhat underwhelmed, we made our way back to the entrance to try and find where the father in law had ended up. He was the only one of our party who was still unaccounted for. Turns out he was relying on his childhood scouts training and he went back to the start to re-group, expecting the rest of us to do the same. Only the start for him wasn’t the entrance to the cemetery. It was our accommodation, about 10 minutes walk up the road. Apparently the rest of us would have made terrible scouts. He was fuming and apparently this is why we never had time to visit Versailles Palace. It’s still a sore point, but one that results in a lot of family jokes, as you can imagine. It’s still too soon for my poor father in law. Simon and I have since been back to Paris and seen Versailles ourselves at least… an experience that far stands out compared to our visit to Pére Lachaise Cemetery. Welcome to #SnapshotStory Link Up. This is where YOU get to share the story behind your favourite snapshots. Think of it as an opportunity to give those favourite photos an opportunity to be the star! 1. Add your post to the link up below – just one. 2. Ensure that you have your link added before the following Wednesday (link-up closes at 11:55PM AEST). 4. Visit, comment on and share other linked up posts. Sharing is caring! 5. Spread the word for #SnapshotStory on social media. All posts will be added to the #SnapshotStory Pinterest board each week. Some of the monuments were really special and I think we saw the one you are talking about too. So many stories to tell for so many people. If only those statues could talk! I went to Pere Lachaise but thankfully went alone, so I was able to take my time and see the graves I wanted to see. I agree the Jim Morrison grave was nothing special, but Oscar Wilde’s tomb was fascinating. I also enjoyed the monuments for World War 1 and 2 at the back of the cemetery. Didn’t get to visit Versailles, must do it next time! Ours was a really rushed visit & unexpected for all but the lost father in law lol it would have been interesting to do a bit of prior research so we could have made our visit more relevant and organised. So much history! I love cemeteries! I think they are fascinating, especially old ones. So many stories about life and history. Does that make me morbid? I just think it is the storyteller in me, that wants to know about other people’s stories and lives. I haven’t been to Paris, so haven’t yet visited this cemetery but hope to one day. (Our wifi has been cut off so I am late to the link-up this week. Will hopefully have our post up in the morning, before the link-up closes). Not at all morbid… The history is so fascinating. Makes you feel amazed & saddened by trying to figure out the stories of people from the past.